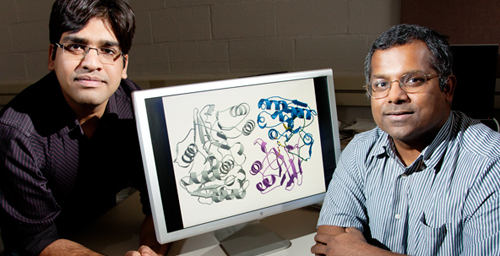 University of Illinois biochemistry professor Satish Nair, right, and graduate student Vinayak Agarwal and their colleagues discovered the mechanism by which some bacteria evade a potent antibiotic. CHAMPAIGN, lll. - A new study describes how bacteria use a previously unknown means to defeat an antibiotic. The researchers found that the bacteria have modified a common "housekeeping" enzyme in a way that enables the enzyme to recognize and disarm the antibiotic. Bacteria often engage in chemical warfare with one another, and many antibiotics used in medicine are modeled on the weapons they produce. But microbes also must protect themselves from their own toxins. The defenses they employ for protection can be acquired by other species, leading to antibiotic resistance. The researchers focused on an enzyme, known as MccF, that they knew could disable a potent "Trojan horse" antibiotic that sneaks into cells disguised as a tasty protein meal. The bacterial antibiotic, called microcin C7 (McC7) is similar to a class of drugs used to treat bacterial infections of the skin. "How Trojan horse antibiotics work is that the antibiotic portion is coupled to something that's fairly innocuous - in this case it's a peptide," said University of Illinois biochemistry professor Satish Nair, who led the study. "So susceptible bacteria see this peptide, think of it as food and internalize it." The meal comes at a price, however: Once the bacterial enzymes chew up the amino acid disguise, the liberated antibiotic is free to attack a key component of protein synthesis in the bacterium, Nair said. "That is why the organisms that make this thing have to protect themselves," he said. In previous studies, researchers had found the genes that protect some bacteria from this class of antibiotic toxins, but they didn't know how they worked. These genes code for peptidases, which normally chew up proteins (polypeptides) and lack the ability to recognize anything else. Before the new study, "it wasn't clear how a peptidase could destroy an antibiotic," Nair said. To get a fuller picture of the structure of the peptidase, Illinois graduate student Vinayak Agarwal crystallized MccF while it was bound to other molecules, including the antibiotic. An analysis of the structure and its interaction with the antibiotic revealed that MccF looked a lot like other enzymes in its family, but with a twist - or, rather, a loop. Somehow MccF has picked up an additional loop of amino acids that it uses to recognize the antibiotic, rendering it ineffective. "Now we know that specific amino acid residues in this loop are responsible for making this from a normal housekeeping gene into something that's capable of degrading this class of antibiotics," Nair said. With this information, researchers - and eventually, doctors and other clinicians - will be able to scan the genomes of disease-causing bacteria to find out which ones have genes with the antibiotic-resistance loop in them, Nair said. "If we know what type of bacteria are causing an infection we know what kind of antibiotic to give and what kind not to give," he said. Nair also is an affiliate of the Center for Biophysics and Computational Biology, the department of chemistry and of the Institute for Genomic Biology at Illinois. The research team included scientists from the Russian Academy of Sciences and Rutgers University.